We all have those mornings when we are in a rush. There are times when we just don’t have the time to fix a big breakfast. Those are the days when many folks turn to freezer waffles – Unless you are dealing with food allergies. All mainstream store brand and name brand freezer waffles contain products like eggs and/or milk so they are out for us. There are some specialty waffles like Van’s that are very good and allergy safe. BUT….They are so expensive at nearly $5 for 1 box! 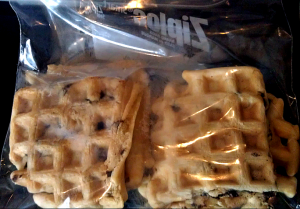 One of the things I like to do is make up a big batch of freezer waffles using our favorite allergy friendly recipe. We enjoy them for breakfast & then I put the rest into freezer bags to enjoy later. My kiddos love this, and it’s so easy to grab one & go when you’re in a hurry. Waffle Iron – This is very important to have a good one here. One of the single kind that you flip over will work fine, but it will take a while since you can only make one at a time. 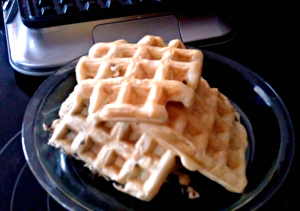 This Cuisinart 4-Slice Belgian Waffle Maker is very similar to mine & works great. Waffle Recipe – I use our favorite Dairy Free Egg Free Pancake Recipe(doubled), but you can use any Pancake Recipe you wish. There is a good Gluten Free Pancake Recipe here if you can’t have Gluten. Freezer Baggies – Make sure you get the kind that has FREEZER on the label or else they will get freezer burn. Once they’re done let them cool then put them spread out on a cookie sheet. Place the sheet in the freezer for a few minutes. They don’t have to be frozen solid at this point. After about 15-20 minutes take them off the cookie sheet and put them in the freezer bag. Store in the freezer until use. Remove desired amount from baggie. Cook in microwave for 1 minute or in toaster oven.